PENDLETON, Oregon – The U.S. Bureau of Reclamation has backed off on flows from McKay Reservoir south of Pendleton. They are releasing a little less than 2,400 cubic feet per second into McKay Creek, impacting homes and other properties along the creek. Flows into the reservoir are down to slightly less than 2,000 cfs. The flood warning for that area is in effect at least until Monday morning at 3 a.m. 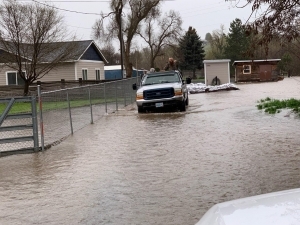 The National Weather Service states that high-water levels could remain constant into next week. The flood warning for the Umatilla River at Pendleton is in effect through late tonight. While the river is at 9.9 feet and flood stage is at 12.3 feet, flooding will continue along the river downstream of Pendleton due to the high outflow release from the McKay Reservoir. There is also a long-term flood warning issued for the John Day River at Service Creek. Early this morning the river was at 11 feet and flood stage is 11.5. Minor flooding is expected to impact Wheeler County. The river is expected to rise above flood stage by Tuesday afternoon and continue to rise to nearly 11.8 feet by Wednesday morning. Forecasters caution that additional flow increases are possible toward the end of the week, because of warming temperatures in the Blue Mountains increasing runoff from melting snow. The weather forecast calls for a 20 percent chance of rain after 11 this morning. There is a 50 percent chance Monday night, dropping to 40 percent by Tuesday until 11 a.m. Following a 20 percent chance of rain late Tuesday night, no precipitation is in the forecast until a slight chance of showers on Friday. Temperatures will remain above freezing at lower elevations. Snow showers are forecast at higher elevations.